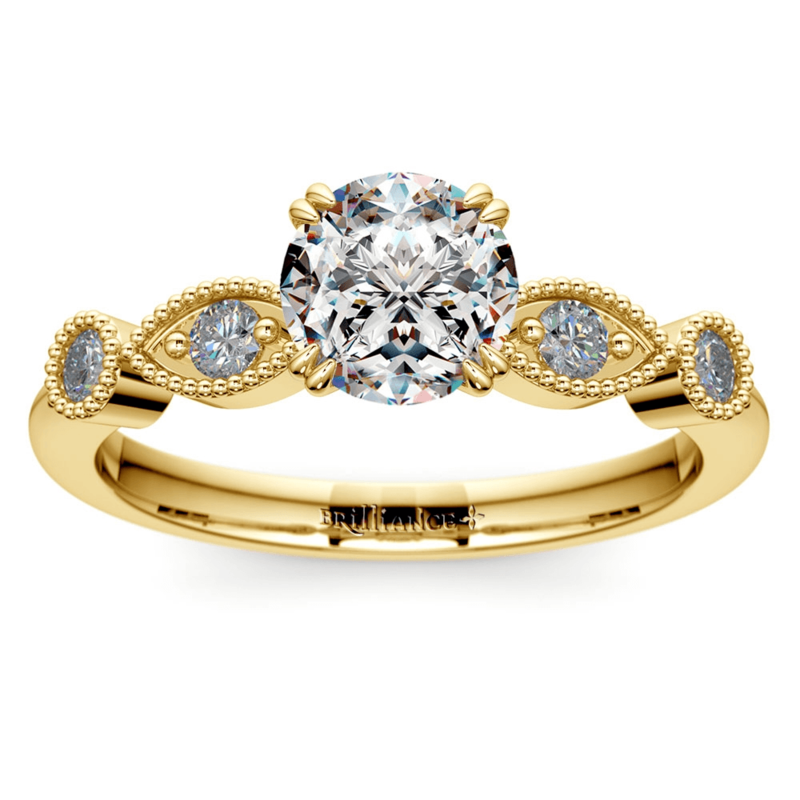 Vintage engagement rings offer unique luxury and a sense of timeless history. Art Deco designs are especially trendy, thanks in part to Baz Luhrmann’s 2013 remake of the Great Gatsby, reminding modern youth about the decadence and artistic splendor of the Roaring 20s. While vintage jewelry appeal to individuals craving a ring with artistic and architectural panache, what many truly antique pieces hide within their historic settings is the secret of blood diamonds. Sadly, before the 21st century, diamonds mined in countries throughout Africa were used by warlords to fund civil wars that ripped apart the lives of many. 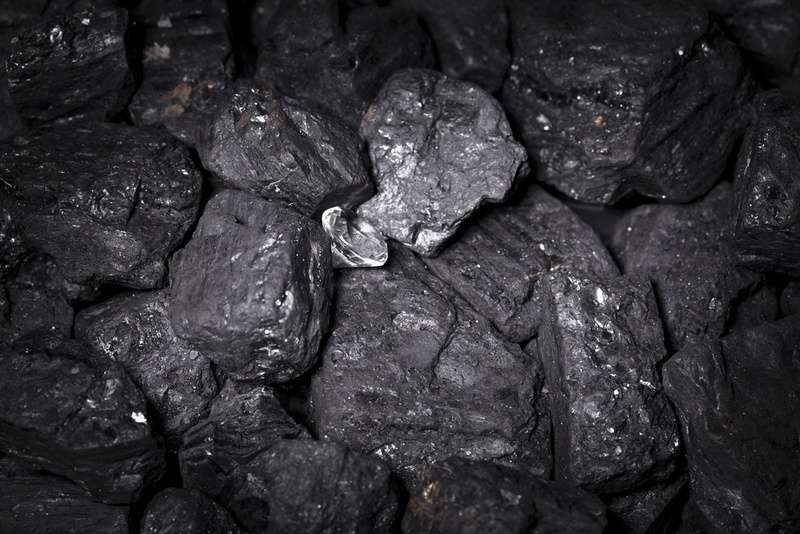 In addition, a large number of diamonds in circulation before the discovery of African mines were outright stolen from India and other colonized countries. Many diamonds mined and sold prior to the early 2000s were deemed conflict diamonds or “blood diamonds” in reference to their connection with these violent circumstances. Without any method of tracking or identifying these stones prior to the adoption of the Kimberley Process Certification Scheme, it’s almost guaranteed that a true vintage piece will feature conflict diamonds. However, new rings purchased from Brilliance feature diamonds that are ethically-sourced and conflict free. As the love and appreciation of vintage settings has increased, so too has the awareness of the danger of purchasing a conflict diamond. Individuals wanting an antique engagement ring may choose a vintage-inspired design that mirrors the look of their more historic counterparts. Aside from the added strength of a new casting, the owner can rest assured that the diamonds being used in the ring are conflict free. From Victorian-inspired intricacies to Art Deco opulence, channel the look of your dreams by selecting from the many beautiful antique-inspired engagement rings, and take comfort in knowing that not a single blood diamond was used in its creation. The Romantic Period of the Victorian Age saw the popularity of jewelry embellished with floral motifs and delicate leaf patterns. Dainty vines scroll around the antique solitaire engagement ring offering a nod to the romantic Victorian Age. Set in white gold, the ring features the signature floral scrolling on both the inside and outside of the band for a complete, three-sided design. Choose a diamond shape that accentuates the antique design of the ring, like the storied cushion, emerald or Asscher cuts. Rings inspired by the Edwardian Period capture the intricate elegance of the time period and often include details like ribbons, bows, floral scrolls and milgrain etching. 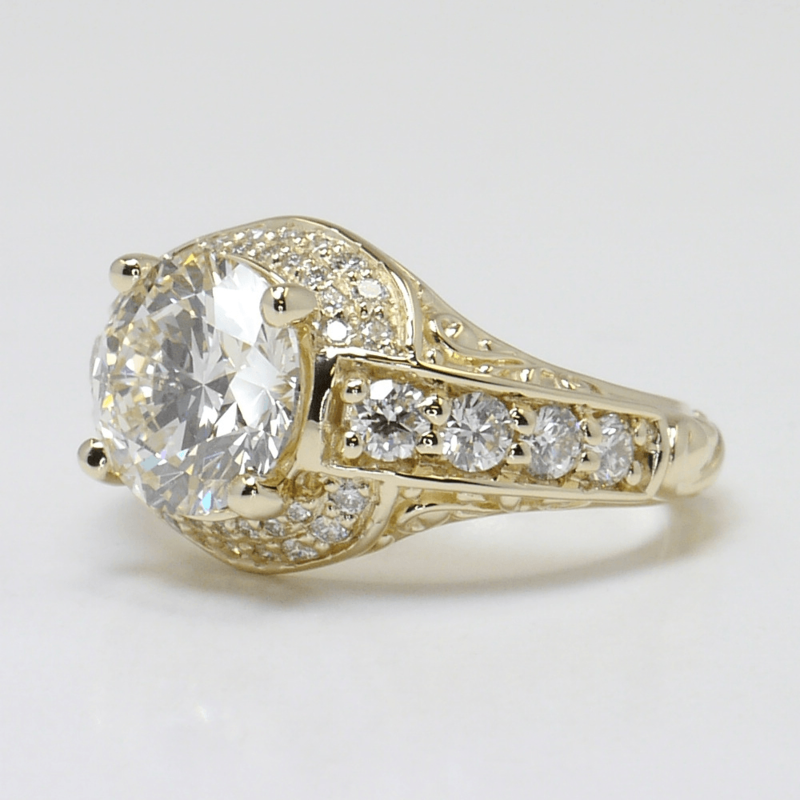 The Edwardian style antique diamond engagement ring features characteristic milgrain and minimal diamond accents. 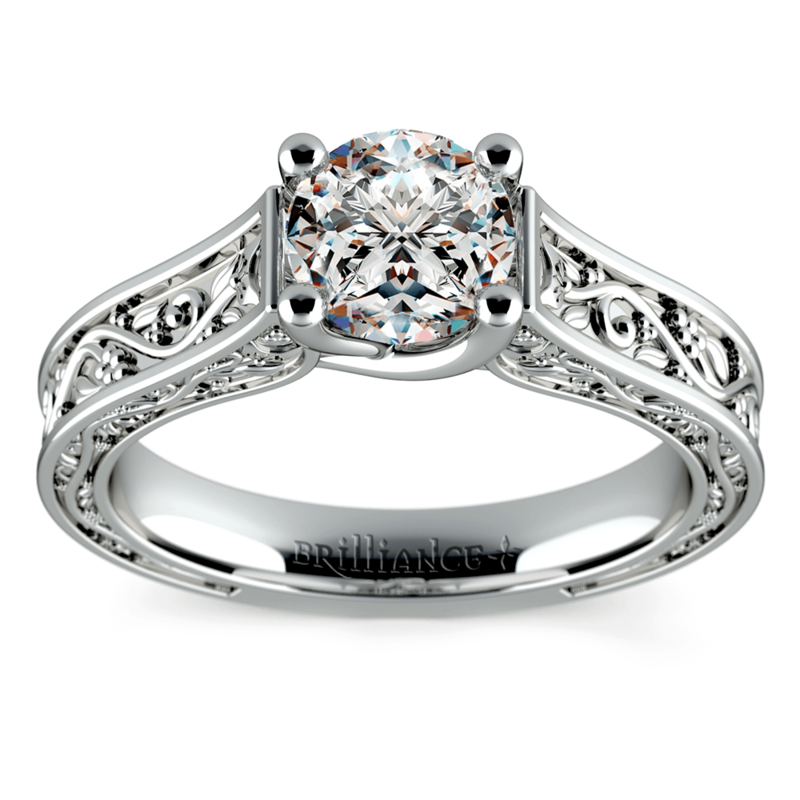 The double claw prongs holding your choice of center stone put the finishing touches on this design inspired by the trends of the early 1900’s. Combining the historic beauty and regality of the Edwardian Period with a touch of modern flair, the antique halo diamond engagement ring boasts a half-carat of diamond details surrounding a delicate and vintage-inspired basket mount. Set in platinum—which was the metal of choice during the Edwardian Period—the ring’s beauty dazzles with any choice of a center stone. A round brilliant adds fire to the setting, while antique-inspired cuts like the cushion or Asscher offer more understated depth. Art Deco wonder found in rings created during the vibrant 1920s also can be channeled through modern Gatsby-inspired engagement rings. 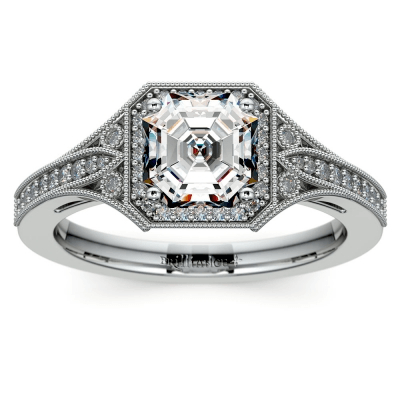 Feel the life of the Jazz Age while wearing the Art Deco halo diamond engagement ring. Multiple pavé and bezel set encrusted diamonds adorn this setting. Milgrain details add a touch of drama to the ring, which can be made in white, rose or yellow gold or platinum. 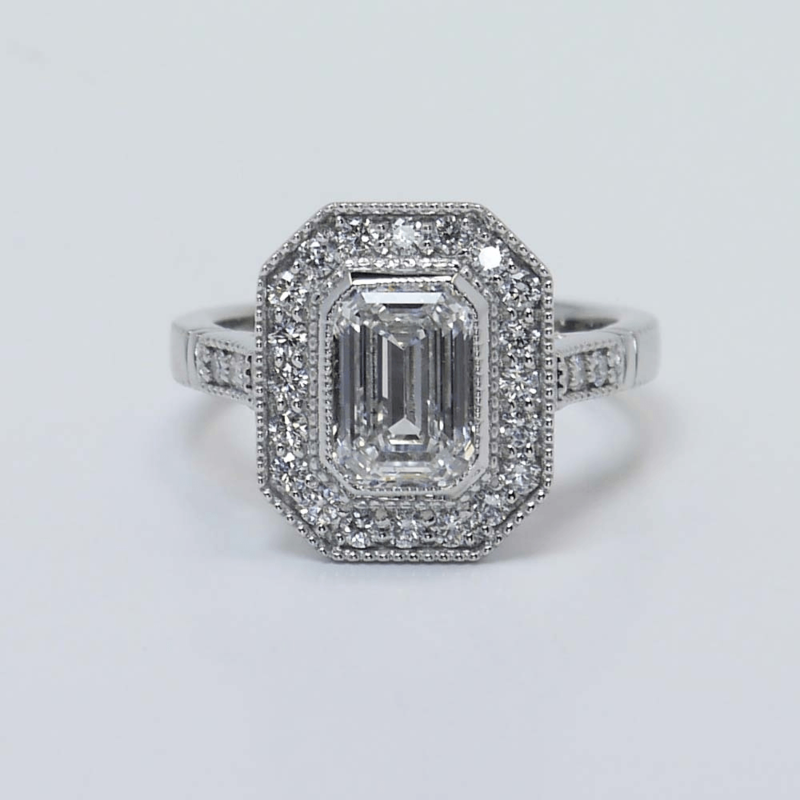 The classic Art Deco look would be finished with an Asscher center diamond, but ovals or cushions would look equally stunning in this setting. This custom made Art Deco ring exudes the prosperity, decadence and glamour of the 1920s. 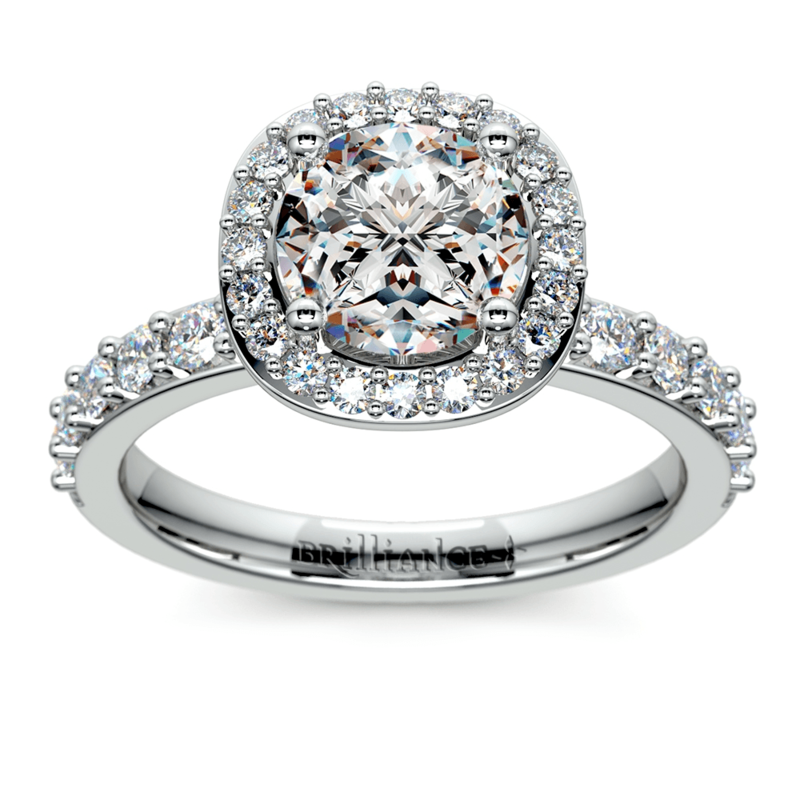 Women with an ‘inner flapper’ will indulge in the architectural elegance of the halo ring. A half-carat of pavé diamonds surround the understated, but luxurious, emerald cut diamond. Selecting a vintage setting for an engagement ring does not mean having to embrace a blood diamond. While diamonds mined before the early 21st century were often characterized as blood diamonds or conflict diamonds, the diamonds sourced by Brilliance are conflict-free. Choose a ring made for you that offers a vintage-inspired design and complete the look with an ethically-sourced, stunning diamond that is pure Brilliance.